Made with one of the best modern English gins going, this fizz is a boozy way to get your dinner party off to a summery start. The gin is made from The Chase Distillery Herefordshire farm’s own-grown cider apples and is smooth and slightly sweet as a result. 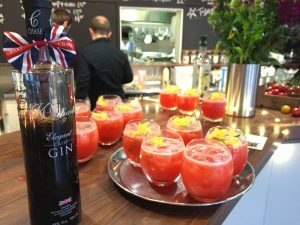 It goes perfectly with the fullness of the strawberry purée and freshness of the cucumber flowers (they are the new courgette flowers, don’t you know, and go the extra mile by handily fitting on top of a cocktail). Developed by drinks expert and writer Claire Dodd, this is a great apéritif ahead of a relaxing summer supper that lasts all evening. In a food processor or in a bowl with a masher, squash the strawberries to make a rough purée. Divide the strawberry purée between six tumbler glasses and add a 40ml shot of gin and 1 tsp of the sugar syrup to each glass. Divide the lime juice, and then fill the glasses with ice to the top. Using a fancy twirly bartender spoon (I borrowed one from Claire) or a teaspoon, stir each cocktail gently to distribute the flavours equally. Top up with the soda water and stir each again, then place a couple of cucumber flowers on top. Serve immediately.